Sanchez talks talk, but will wins follow at UNLV? 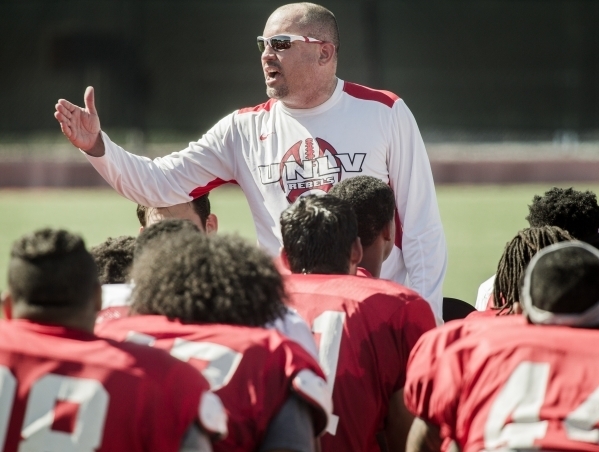 Say this for Tony Sanchez: He has spread the word about UNLV football like a politician might his platform around Iowa cornfields. DEKALB, Ill. — The literal definition is one who controls access to something, like a city gate. It once referred to those individuals who decide whether a given message would be distributed by a mass medium. “You’re the gatekeeper to the culture,” Sanchez said of his job as the first-year coach of the Rebels. “That’s really what I’m doing right now, trying to emphasize how important this is to the community, how important it can be to the school and really try to create climate change around here. We’re excited. 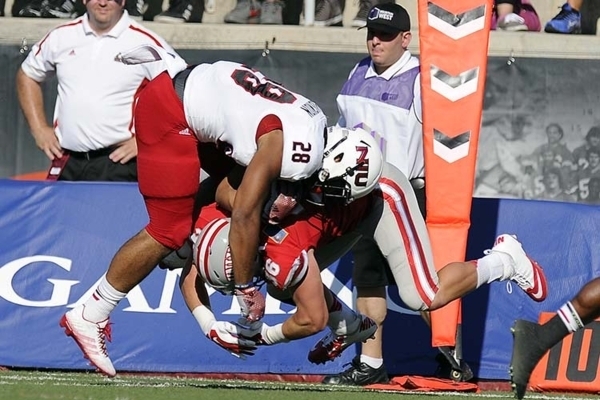 It will be a more strenuous mountain to scale than McKinley or Denali or whatever that famous peak in Alaska might be called this week, a challenge today most believe UNLV isn’t talented enough to overcome. The time for talking and interviews and pep rallies are about to be replaced with reality, and it could be a rough one to start. 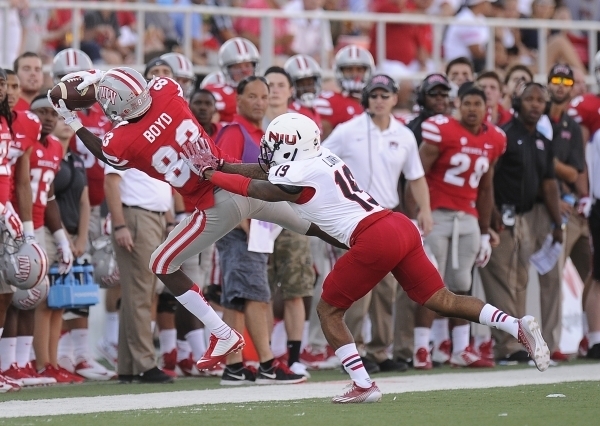 The Rebels are here to engage Northern Illinois, a team from the Mid-American Conference that has made a national name for itself by winning 57 games over the past five seasons and having crashed the Bowl Championship Series party in 2012. DeKalb is located 65 miles west of Chicago, the birthplace of barbed wire and home to the state’s second-largest university, whose football team happens to be more than a three-touchdown favorite against UNLV. Get used to it. The Rebels probably won’t be favored more than a few times this season, most having already assumed Sanchez is merely pouring the concrete for a structure of success he hopes to raise in the coming years. Problem: There is a group of seniors that doesn’t possess the remaining eligibility needed to wait out such a goal. “The first time we met Coach Sanchez, he stood in front of us and said, ‘This is obviously going to be a process, but I want it to start this year,'” quarterback Blake Decker said. “For the seniors, that gave us a lot of reassurance that this wasn’t going to be treated like a rebuilding year just to go out and get a couple wins. Although the expectations for us outside this room might not be high, they are for us. 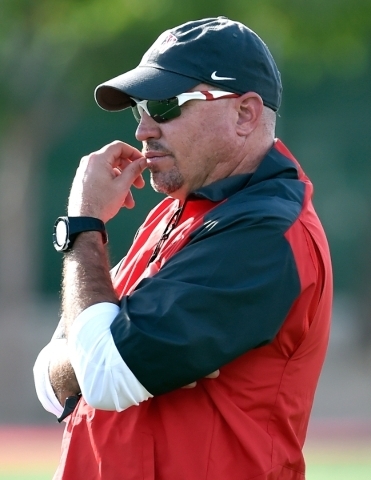 When he was winning six straight state championships and a national title at Bishop Gorman High School, Sanchez never wavered from the statement that his team prepared precisely the same way each week, whether the opponent was also ranked nationally or one of the local sides the Gaels annually throttle. That mindset could be tested often this season. UNLV could start 10 seniors today depending on how the depth chart ultimately falls before kickoff, and the last thing any of them want to believe is that those now coaching the Rebels are thinking more about the future than present, that they’re dreaming about granite countertops and fancy cabinets down the road than focusing on the foundation today. Cultures can be slower to change than drips of water from a faucet, and it’s not as if other coaches with legitimate credentials upon arriving at UNLV didn’t also believe it possible to produce a consistent winner. A legend (John Robinson) couldn’t do it. A highly regarded offensive coordinator (Mike Sanford) couldn’t. A successful Football Championship Subdivision coach (Bobby Hauck) couldn’t. Sanchez also won’t without an upgrade to facilities, meaning UNLV better discover a way to finance that proposed on-campus facility of new locker rooms and a weightroom and training room and offices and enough bells and whistles to force recruits who wouldn’t otherwise give the Rebels a second glance to at least stop and look. Until then, he begins a maiden season today as the high school coach who has been handed the keys to a perennial losing college program. “I don’t think it’s a matter of those other (coaches) couldn’t get it done and I can,” Sanchez said. “I just know this is an opportunity I have been afforded, and I’m going to take advantage of it. We’re going to give a phenomenal effort, and I believe 100 percent we will get this thing going and turn it around for a lot of reasons. “Sometimes, you’re in the right place at the right time at the right moment. I think I’m good at what I do and am very fortunate for this opportunity at this point in my career. Right now, we go into a season with a puncher’s chance, and over the years, we will continue to develop and get better and better. The gatekeeper has spoken, and his message has been spread all across Nevada and beyond for months. Now, let’s see his team. Reality, whatever that might prove to be, kicks off in the home of barbed wire today.